A strong area of low pressure for the middle of June was situated near Sioux Falls, South Dakota this morning moving east. North of the low is an extended area of that low pressure (inverted trough) near the Red River Valley. 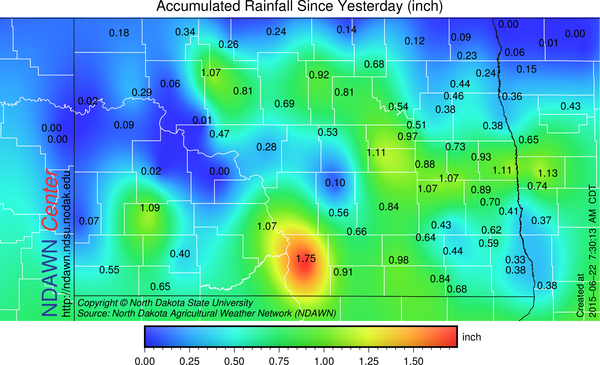 Precipitation yesterday into early this morning ranged from zero (or a trace) to around 2 inches in some locations. Any additional moisture today looks light and spotty. 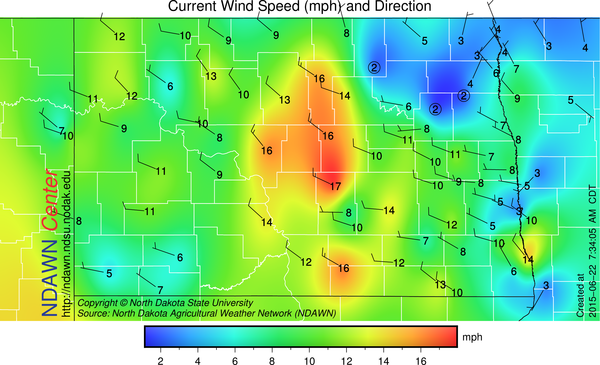 That trough is serving as a wind shift line that has (or will) induce a west to northwesterly wind through the day. Although, atmospherically, cooler air is moving into the area, a west/northwesterly wind tends to maximize the potential maximums in our climate, so although many locations will be cooler than yesterday, high temperatures are still expected in the 70s. The wind speed today in the 10-25 mph range. This week will generally feature a west / northwest upper-level flow that will trend more northwesterly in the next week as a large “heat ridge” builds over the Rocky Mountains. This should create above average temperatures in the western one-third of the lower 48. Below average in the eastern one-third and near average in the central one-third of the lower 48 states. In North Dakota and northwestern Minnesota the projection is near average to trending a bit above average through the next 10 day period with precipitation overall near or below average during this period with the always exception of those locations hit the hardest by any thunderstorms. One of those thunderstorm opportunities looks to be Tuesday night into Wednesday when an area of low pressure moves through the region. After that low then the upper-level flow will transition more to the northwest meaning a drier flow and any disturbances would be lacking moisture meaning, the thunderstorms on any given day would be more on the isolated side. Therefore, average temperatures, trending warmer, with near to below average precipitation foreseen overall through July 4.